Nestled in the valley of The Glenkens, which runs north from Loch Ken, is New Galloway, a pleasant little village of whitewashed houses surrounded by beautiful countryside and close to the Galloway Forest Park. A few miles north of New Galloway is the village of Dalry, or St John's town of Dalry, to give it it's full name, sitting beside the Water of Ken and giving access to the Southern Upland Way. About five miles farther north on the A713 is the turning to Polmaddy Settlement, a reconstructed Galloway village dating from before the Clearances of the 18th and 19th centuries. To the west of New Galloway lies Galloway Forest Park,(website) the largest forest park in Britain, covering 300 square miles of forested hills, wild and rugged moorland and numerous lochs. It's a vast and beautiful area criss-crossed by waymarked Forestry Commission trails and longer routes, such as the Southern Upland Way. It's also home to a rich variety of fauna, such as feral goats, red deer, falcons and even golden eagles. Those wishing to hike in the park should be properly equipped and buy the relevant Ordnance Survey maps. The OS Outdoor Leisure Map No 32 covers Galloway Forest Park. Also useful is The Galloway Hills: A Walker's Paradise, by George Brittain. See also under Newton Stewart below. The A712 runs southwest from New Galloway, cutting through the southern section of the Galloway Forest Park, to Newton Stewart. This 19-mile stretch of scenic road is known as The Queen's Way. Seven miles southwest of New Galloway the road skirts Clatteringshaws Loch, hidden amongst the pine trees, with a 14-mile footpath running round it. This path joins the Southern Upland Way which winds its way north towards the Rhinns of Kells, a range of hills around 2,600 ft that form the park's eastern boundary. On the shores of the loch is the Clatteringshaws Forest Wildlife Centre, which gives an introduction to the park's flora and fauna. Info: Easter-Oct daily 1000-1700. Free. Tel 420285. From the centre you can follow the lochside trail to Bruce's Stone, a huge boulder marking the spot where Robert the Bruce is said to have rested after yet another victory over those troublesome southern neighbours. There are several hotels and B&Bs in the village. On the High St, there's the small and comfortable E Leamington Hotel, Tel 420327, Leamington Hotel which does evening meals; and the Cross Keys Hotel, Tel 420494, where you can also get bar food. 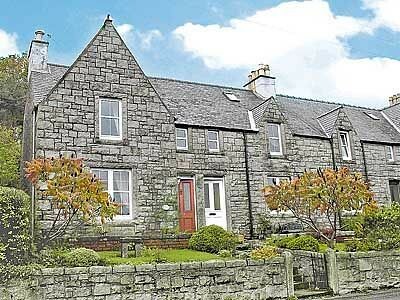 A few miles to the east, in the village of Balmaclellan, is High Park, Tel 420298, a farmhouse B&B. There's also a youth hostel at Kendoon, Tel 01644-460680, 5 miles north of Dalry on the B7000, close to the Southern Upland Way and the A713. It's open mid-Mar to early Oct. Take the Castle Douglas-Ayr bus and ask to get off near the hostel. At the bottom of the High St is E-F The Smithy, Tel 420269, which offers B&B accommodation and is also a café/restaurant/bookshop. It provides essential information on walks in the forest park, rents bikes and also serves home-cooked meals and tasty snacks (try their oatcakes). It's open daily Mar, Apr and Sep 1000-2000, May-Aug till 2100 and Oct till 1800.